I've been sewing a little lately, and came up with these. I love retro tea towels, and there's always a good supply of them in the Op Shops/Thrift Stores around me. 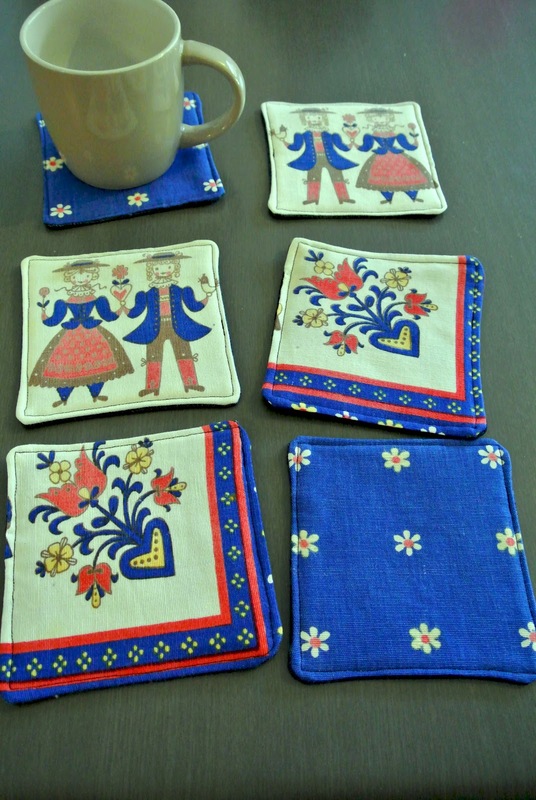 Some are a little worse for wear, or have sections that are worn or stained, and these are perfect for cutting into and making into coasters. While I love the cool floral of the first set, but who doesn't love a bit of Australiana kitsch! A giant crocodile next to a scenic boat cruise - I love it! My coasters are made from two fabric squares, about 11cm all round. I use vintage tea towels and denim, but you could use anything from your stash... I have a few coffee sacks in the stash that I also think would look very cool! I also add in a layer of wading to make them sit nicely. After lots of encouragment from family and friends, I've gone ahead and set up a madeit store, Paisley Vintage. If you have time please head on over and check it out, and I'd love to hear your thoughts or feedback if you have any. I'm working on an etsy store too, but one thing at a time! It's a crazy, scary adventure, but I'm ready for it! Such a cool idea and love the croc one!! Well done you on the store!!! That is so fantastic!! Love the name too and I'll check it out tomorrow, we are off to the movies now! Congratulations on your new store! I wish you all the very best. So cute! I make coasters too but I love your vintage spin on them. Great job! Visiting from the party at Not Just a Housewife. I'm so glad that I'm following you! What a clever idea. Thanks for the inspiration!